Bring this party in for landing with this adult mile high pilot costume! 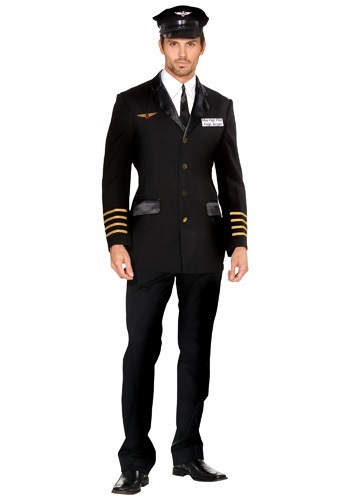 This costume includes a black pilot's coat with a wings patch sewn on the front chest. The jacket, made from a light-weight 65% polyester 35% cotton blend, has 4 gold pilot stripes near the wrists and gold buttons that close the jacket up. The jacket also contains 2 pockets in the front for storing any of your piloting items. The costume also includes a pilot hat with a shiny vinyl appearance brim and an eagle patch on the front. The hat fits most sizes with an adjustable snap band in the back of the hat. The 100% polyester shirt collar and black tie neck piece fits around the neck with a Velcro patch to make you ready to join the mile high club. 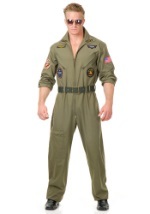 Just in case anyone forgets who you are, this costume comes with its own funny name tag that reads "Mile High Pilot Hugh Jorgan." Ensure that your party gets sky high!